On a gorgeous, blue-sky Seattle Sunday July 24, 12 intrepid contestants, including two 5-dans, assembled at the Seattle Go Center for the second Tacoma Go Club hosted tournament in a row: the 2011 Congress Tune-Up, with Gordon Castanza as the tournament director. Originally scheduled for four rounds, the players decided that missing the rest of a day on which temperatures rose to 82° F was too much to endure. Consequently, after three rounds, everyone was looking for the exits, and even the Tacoma Go Club’s pizza lunch couldn’t keep the contestants indoors. The final standings saw Solomon Choe 5d and Eric Feiveson 3k finishing the tournament with three wins apiece. 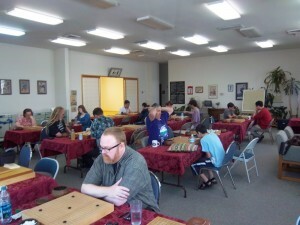 Both Joshua Hall 9k and Jon Boley 5d won two out of three games.